Zalora.com.ph is the biggest online retailer of fashion and apparel in the Philippines. Shop online at their e-commerce store for the trendiest clothes for men and women. Buy a new outfit from a huge selection of shirts, swimsuits, shorts, t-shirts, jackets or buy the latest fashion accessories such as eyewear, bags, shoes & watches and have them all delivered to your door within days. Save money with our Zalora voucher codes & coupons, whether you need a new tie for your suit, a pair of new sneakers for the gym or a elegant dress with matching jewelry be sure to use our free Zalora promo codes & deals for instant discounts and enjoy huge savings when you checkout online. Zalora Philippines launched in 2012, on a mission to become the leading online fashion retailer in the country by offering the latest and largest selection of clothing from top brands, labels and designers fresh off the runways, from high fashion to casual wear, formal outfits to swimwear, they have everything you need to keep on top of the latest trends and styles. Owned and started by Rocket Internet group, one of the worlds leaders in e-commerce, they now operate the Zalora brand across 8 countries around Asia and with several $100 million dollar investments backing their company and with over 100 staff based in Metro Manila they have become one of the most trusted online stores for Filipinos to get the latest in fashion, clothing, accessories, beauty products, jewelry, bags, shoes and much more. Zalora also offers an impressive selection of payment methods from credit card, bank payments, paypal and cash on delivery nationwide to most areas to make paying for your order as convenient as possible and with fast shipping times of 1-5 days it makes Zalora the go to store when you want to buy clothing online in the Philippines. To use a Zalora Voucher or promo code is easy and you’ll be enjoying your discount in just a few clicks. To get your voucher code you need to browse the above page until you find an offer that you like. Zalora likes to reward their shoppers which means we have a lot of great promos so choose wisely for maximum savings. When you find a code that you like click ”Get Voucher Code”, a new window will open displaying your code, either click the orange button that says ”COPY CODE” or just make a note of it by typing it somewhere on your computer or write it on a piece of paper, you’ll need to use this code at the Zalora checkout page to receive your discount. 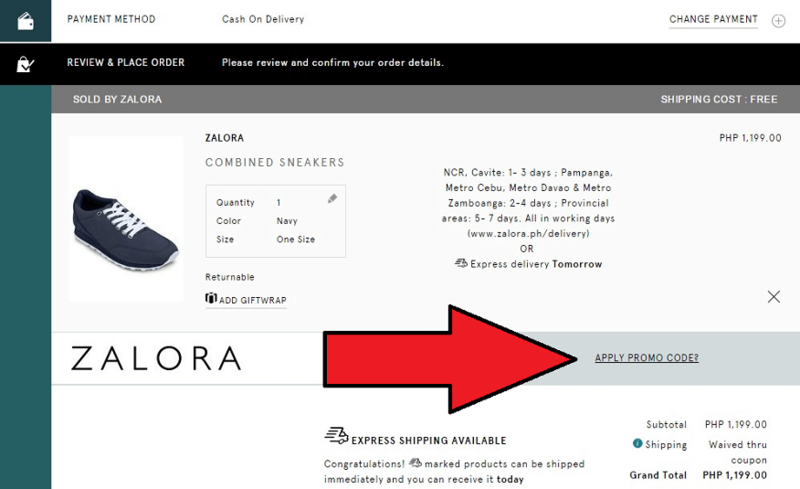 Then below the code click the green button that says ”Go to the Zalora website”. Now that you’re on the Zalora.com.ph website you can browse and shop for as many clothes, shoes, jewelry or even beauty products that you want, use the navigation bar at the top of their website to choose which category you want, you can also select to see only men’s or womens’ clothing, or when filter your search by price and sub category. When you see some clothing or accessories that you like click on the item to be to taken to the product page, there you can choose the product size, color and check availability, then simply click the black button ”ADD TO BAG”. If you would like to maximize your voucher code then you can keep shopping for more products or if you’re finished shopping click in the top right of the page ”MY BAG” and then click the black button at the bottom of the dropdown bag that says ”CHECKOUT NOW”. Once you’re on the checkout pages (have a look at the below screenshot) you’ll first need to sign in or register, then you’ll be asked to confirm your shipping address and you’ll also be asked to choose your payment option before you finally reach the page where you can enter your promo code which is where the fun (and money saving) begins. In the ‘review & place order’ section check that your order looks good and that you’ve chosen the correct size and colors, then look for the text that says ”APPLY PROMO CODE?” (check out the screenshot below for help), that’s where you need to enter the code we gave you, Click on the text and paste the coupon code in and then click ”APPLY” to instantly receive your discount. When browsing the above page, you’ll notice we have different offers, some are zalora vouchers or promos in which case you need to follow the above instructions. Others offers are exclusive or special ‘SALES’ and ‘DEALS’, for these you simply click on the green button that says ”Get This Offer” and you’ll be taken directly to the promo page when you can enjoy the promo.